In The Know Cycling readers can get a one-time 10% Competitive Cyclist discount on many products in their store. 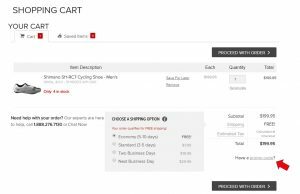 To get the discount, click this link to Competitive Cyclist or any you see to the store on our pages, put the items you want in the shopping cart, and enter the promo code ITKC10 just below your total before you checkout. The arrow in the example below shows where to enter the code on the Shopping Cart page. Competitive Cyclist’s systems are set up to recognize you as an In The Know Cycling reader and validate this exclusive promo code only when the link you make between the sites is uninterrupted. 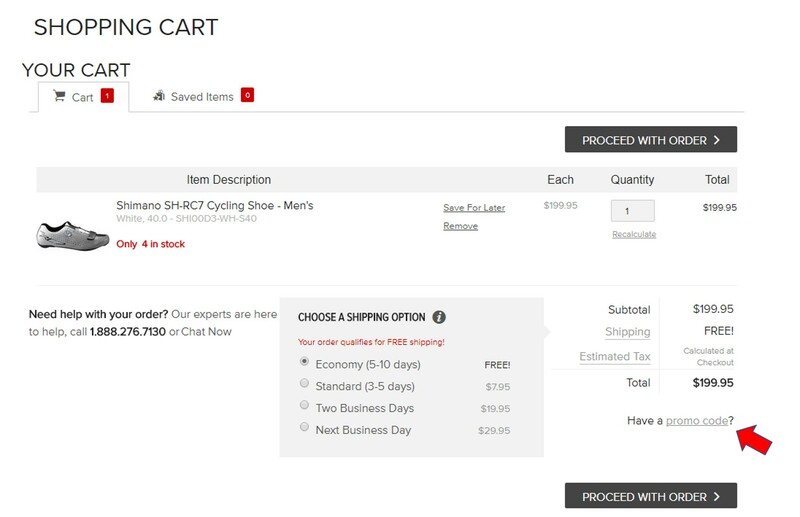 You will not get this discount if you place an order through a Competitive Cyclist product support representative, agent, Gearhead, over the phone, through the online chat, by going through a link from Google or another site, or by going directly to Competitive Cyclist without first getting there by clicking a link from this site. Complete bikes and bike frames are excluded from this discount program as are special orders, package discounts, prior purchases, and gift certificates. Because of agreements with suppliers, products from the following brands are also excluded from this discount program: Arcteryx, Assos, Bell, Blackburn, Chris King, Deity, ENVE, FeedbackSports, Five Ten, Fox Racing, Fox Racing Shox, Garmin, Giro, GoPro, HT Components, Kinetic, Lizard Skins, Park Tool, Pika Packworks, Pioneer, POC, Powertap, Quarq, Reynolds, RockShox, Rotor, Salomon, Selle SMP, Sidi, Skratch Labs, Smith, Speedplay, SRAM, Stages Cycling, Suunto, Thule, Thule Chariot, Troy Lee Designs, Wahoo Fitness, WTP, Yeti Coolers, and Zipp. Sorry, I don’t make the rules or determine the exclusions. I just work to get you good In The Know Cycling readers the best discounts I can. Thank you.